After a break-in at their London home, Kat Wolfe and her veterinary-surgeon mum decide it’s time to move to the country. 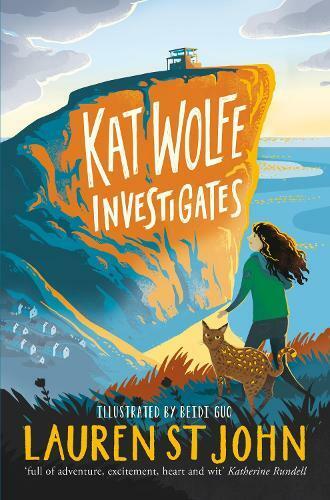 Dr Wolfe’s new job in idyllic Bluebell Bay on Dorset’s Jurassic Coast comes with a condition: they have to adopt Tiny, a huge, near-wild Savannah, who resists Kat’s best attempts at cat whispering. When she starts a pet-sitting agency to make pocket money, her troubles escalate. The owner of her first client, an Amazon parrot, vanishes from his fortified, gadget-filled mansion, leaving a half-packed suitcase and a mysterious parcel. The only person who shares Kat’s conviction that he’s the victim of foul play is Harper Lamb, the American daughter of a palaeontology professor. A language and coding whizz, Harper is laid up with two broken legs thanks to her racehorse, the ‘Pocket Rocket’ - Kat’s newest client. What starts out as mystery-solving holiday fun quickly turns deadly for Wolfe and Lamb. When all clues point to an army base, can they count on their unruly animal friends to save the day - and their lives? Animal lover Kat Wolfe is delighted when her mum accepts a job as a vet in idyllic Bluebell Bay. Kat decides to earn some pocket money by starting the Paws & Claws Pet Sitting Agency – but when her first customer goes missing, what started out as a promising escape from city life quickly escalates into an increasingly dangerous mystery. Kat’s new friend Harper Lamb is laid up with two broken legs, but she is not about to let that stop her getting involved. The girls are determined to solve the clues the missing man has left – and they have half a zoo to help them! Like any good mystery, Kat Wolfe Investigates is packed with twists and turns, but this fast-paced and exciting adventure also will have you giggling out loud in a few places (Nancy Drew never had a movie-quote-loving parrot to help her!). This book is a must-read for animal lovers and mystery fans and this is just the beginning for Wolfe and Lamb’s adventures!